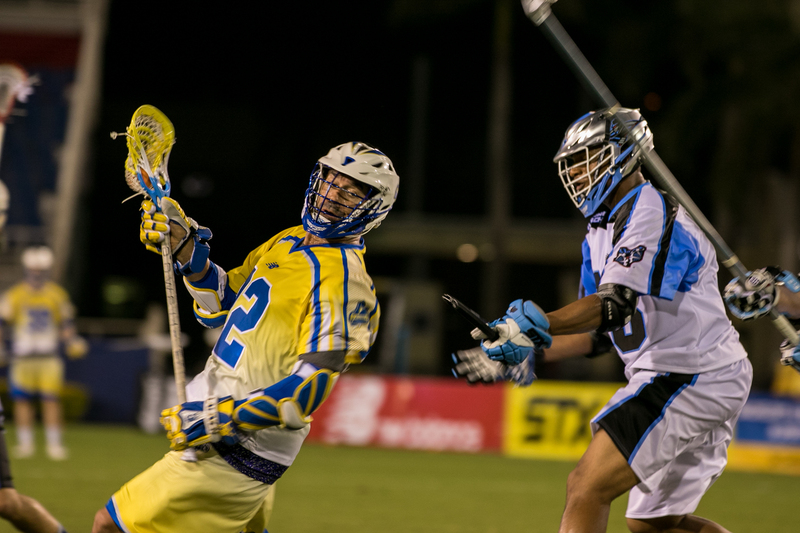 In an entertaining and well-played game, the Ohio Machine opened the 2016 season defeating the Florida Launch 16-14. This victory marked the Machine’s first win in the Sunshine State. Six different players scored as the Machine answered every run that Florida launched at them. Having made the playoffs two years in a row, Ohio has high expectations as they managed to keep their core players on the roster despite the expansion and supplemental drafts. The Machine are no longer content to make the playoffs and hungry to win a Steinfeld Cup. The Launch are looking to build on the success they showed in the latter half of last season and produce a winning record. Both teams look to be on track to achieve those goals. The Machine offense has been dynamic and a strength of the team and last season their defense developed into a solid unit and they found success at the face off X with Greg Puskuldjian. Going into this game things did not appear to be in Ohio’s favor. The Machine had never won at Florida and in an eerily similar repeat of last season, Scott Rodgers was injured early. Rodgers was Ohio’s unsung hero last season and slatted to be the starter. A training camp injury led to the decisions to rest Rodgers and start Adam Fullerton. Fullerton made 8 saves, the defense allowed 2 goals on 6 penalties, and Puskuldjian went 16-32 at the X. It was a rather impressive performance by the Machine. The Machine offense operated like its namesake and led at the end of every quarter. Ohio had an answer for every run the Launch attempted. I made a mistake failed to give Mark Cockerton any attention in my preview piece and he made me and the Launch pay with 4 goals, Marcus Holman kept pace with 3 goals and 1 assist while Peter Baum had 3 goals and 2 assists. Kyle Harrison had a 2 point goal and Mike MacDonald had 2 goals while Brandon Mangan had 1 goal. Balanced scoring was a major factor in the Machine victory and the search for depth showed some early signs of success. Despite the loss, Florida had many positives that bode well for their success this season. Many coaches and front office personnel say that it is best to get Florida early before their indoor stars join the roster. Among those fulfilling indoor commitments are the Thompsons (Miles, Lyle, and Jeremy), Connor Buczek, and Chad Tutton. Despite these players’ absence, the Launch scored 14 points. Roman Lao-Gosney opened up the scoring with the first goal of the game. Casey Powell was the legend Casey Powell and dropped 4 goals and 3 assists while newcomer Owen Blye scored 4 goals. Steven Brooks and Kieran McArdle each had 2 goals and Nikko Pontrello added a goal. Like the Machine, Florida had six different players score and their offense was able to keep the game within reach. The Launch scored 5 goals in the fourth quarter and appeared poised for a come from behind victory. If Florida maintains this productivity when the rest of their protected roster joins the team the Launch will have on of the most potent offenses in the league. On defense, Florida seems to be content to go with a two goalie rotation splitting time between Austin Kaut and Brett Queener. Kaut made 7 saves, collected 3 ground balls and allowed 10 goals while facing 17 shots. Queener made 8 saves, collected 5 ground balls and allowed 5 goals while facing 13 shots. Queener has played in a two goalie system before and it is seems to thrive on coming in and providing a spark. Tucker Durkin led a much improved Florida defense that did not back down from Ohio’s potent offense. The Launch made several stands on defense that turned away the Machine and gave their offense the ball. This was not last year’s defense and the growth and maturity was evident as they kept their composure and the score close despite Ohio going a scoring runs that put the Machine up 6-3 at the end of the first quarter and 10-6 at halftime. Chris Mattes quietly continues to produce solid numbers for the Launch going 13-21 at the X. Somebody vote this guy on the All Star team! Florida only had a brief scrimmage and no extended training camp, but played a penalty free game and scored 2 goals on man up as Ohio committed 6 penalties. Florida travels to Chesapeake to take on a Bayhawk team looking to regain its prominence in the league while Ohio travels to Denver to face the Outlaws in their season opener. Florida will be looking to rebound from losing at home and build on some solid performances and produce a complete game while Ohio looks to continue to prove this is their year to win a championship.